This nicely decorated peaceful and quiet direct Beachfront 3 bedroom (Queen, twin trundle, 2 twins in downstairs bedroom)2 bath (one upstairs and one downstairs) cottage with spiral stairs connecting up/down. On Phillips Road (a private road in Sagamore Beach (a private beach), near Scussett Beach, Cape Cod Canal, and bike path has all the amneties you can think of. Fully stocked kitchen with pots for your lobsters and steamers, pans, dishes, cups, microwave, blender, coffe maker, utensils, dishwasher, washer and dryer, along with an additional outside shower, we also have 2 cable TV's, VCR playerand FREE WIFI Internet. 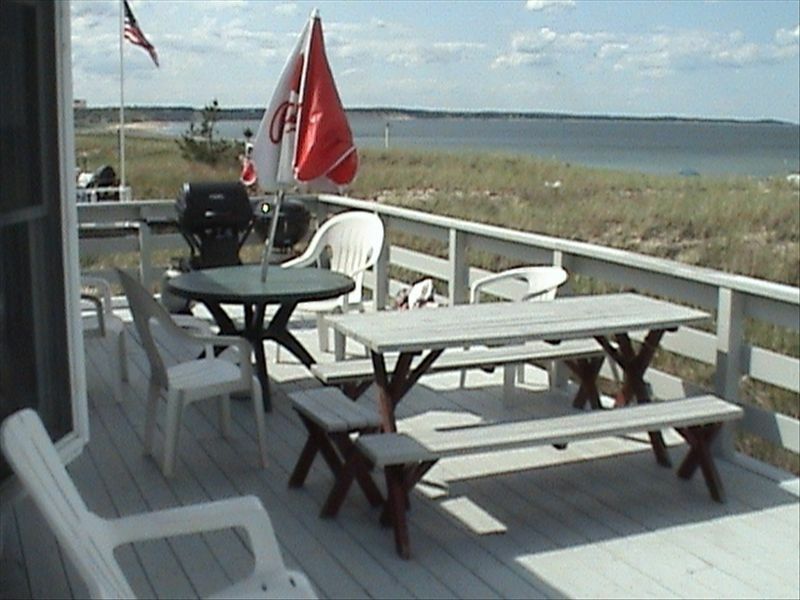 A big deck for cook out or just watching the beach. Beautiful sunrises on beach side then sunsets on marsh side, you couldn't ask for a more tranquil and relaxing setting.